In a large mixing bowl, dissolve the yeast in the water; add the milk. Let stand 5 minutes. Add the sugar, egg, cardamom, raisins, and salt. Add the softened butter and 1 cup of the flour; beat until smooth and satiny. Gradually add the remaining flour, mixing until dough is smooth and satiny, not quite stiff enough to knead. Cover and let rise for 1 to 2 hours until doubled. 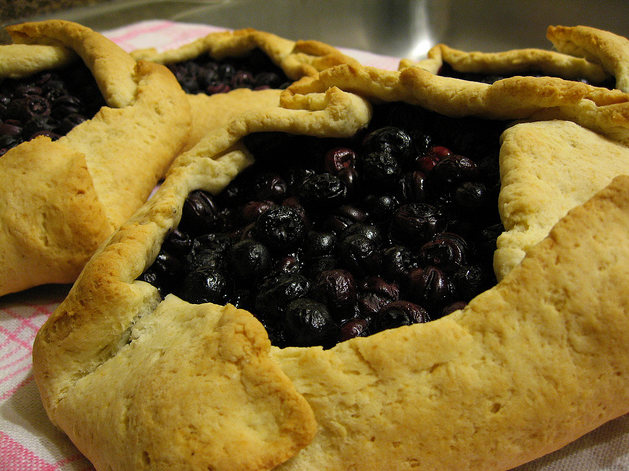 Meanwhile, combine the blueberries, cornstarch and sugar. Dust the risen flour. Shape into a ball, dusting with flour lightly, if necessary, to prevent stickiness. Lightly oil a work surface. Turn dough out onto the work surface and divide into 12 parts. Cover a baking sheet with parchment or lightly grease it. Roll dough into smooth balls and place on the baking sheet with the smooth side up. Let rise until puffy, 45 minutes to 1 hour. With a floured glass, press an indentation into the center of each round of dough, and a rounded edge on each ball. Spoon filling into the center of each bun. Beat the egg and milk to make a glaze and brush edges of the pastries with the mixtures. Hi- these look delicious and i have all the stuff!! Im not sure your directions get me to the appearance in the picture. I could use a few more details. In #3, How big are these smoothed balls- diameter and flatness? And #11- am I pinching/forming a bowl shape? What size am I going for here- cant tell from the picture? Im not used to working w yeast dough so sorry for the questions. Always excited to find new ways to use berriees. Thanks!